Can going to the dog park too much be bad for your dog? Right and wrong ways to socialize your pet. The idea of a well socialized dog is a concept we all talk about, think about, and strive for, but what does it really mean? Most pet parents and veterinarians will tell you it is important to socialize your dog (and indeed it is) but are there right and wrong ways to socialize a dog. If so, is there one type of socializing that is acceptable for every dog no matter the age or breed? According to most pet parents, “socializing” means to get the dog out in the world and interacting with as many dogs and people as possible soon after he joins your family. Despite most of our good intentions, sometimes socializing a dog isn’t as easy as it seems and takes some careful consideration for it to be healthy for its mind and body. The real question is how do you go about socializing a new dog? If your dog is a young dog, you can go to puppy class and puppy meet-up groups. Ask your veterinarian for a recommendation to make sure the people running it are qualified to do so. Young dogs are like little sponges and need to have experiences with other dogs and new people to get a taste of the real world that exists outside of the home. Although young dogs are indeed dogs, like young children, they lack the subtle gestures of canine communication. Dogs have a wonderfully complex system of non-verbal communication that is learned through play and interaction. Puppies often have to learn through trial and error how to interact with a new dog. Not unlike children, puppies can be very rude and self-centered. They run forward and jump on the new dog without using any manners. If that is an older dog, he may not take kindly to the approach and it could result in a scolding. Many pet parents would agree that scolding is exactly what the young dog needs but not all adult dogs are fair or just in the corrections they give and some can be downright mean. Taking your dog to a puppy class or group that lets them socialize with other young dogs who are also learning this complex canine communication. This allows for more understanding and more fooling around with less worry of fighting and negative experiences. There are not as many structured socializing opportunities for adult dogs as there are for puppies. There are, however, lots of doggie daycare operations springing up across the United States. Search online and read reviews to find a good dog daycare; they are not all created equal. Try to find one where the staff gets to know you and your dog, has rigorous vaccine policies, and are sticklers for cleaning and giving the dogs lots of breaks. *Tip- Avoid doggie daycare where there are huge groups of dogs all out together all day long (more than 15 dogs at a time is too many). Dogs need breaks and a chance to regroup. Also they will do best with dogs that play similar to them, so the more dogs in one area, the more opportunity for a misunderstanding or incident. When you socialize your dog, it should be for a relatively short period of time and it should always be positive. If your dog is having negative experiences when socializing, like getting involved in fight behavior, being injured, or hurting other dogs, he may not be right for that type of play. While many dogs can do group play successfully, it is not for every dog. Some dogs feel very overwhelmed and stressed out in group dog settings. Dogs in general tend to try to play with one dog at a time. They will gravitate toward one dog and focus on that interaction. Group settings make it difficult to establish communication and healthy play if there is another dog trying to interrupt and be involved. If you meet a dog your dog loves to interact with, consider setting up a play date. 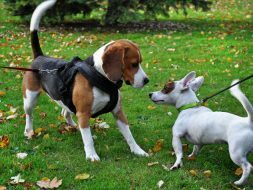 While there are dogs that go to dog parks and have a great time, there are sometimes behavioral problems that can arise from too frequent visits. The big issue with the dog park is dogs are engaged in “over-arousal” play and for long periods of time. This means the play is hard, noisy, and fast paced and often goes on for far too long. It doesn’t take much for it to tip from fun to frustration and that is when trouble can arise. As if a dog dispute isn’t bad enough, then you may have an awkward owner encounter. If all goes well and your dog doesn’t get into fights, this type of frequent over-arousal play can still lead to an “over-socialized” dog. I meet dogs every week who really love other dogs so much that they bark and pull and lunge to get to them when they are on a leash in public. These dogs have met and played with far too many dogs in group settings that now it is difficult to be in the presence of other dogs. A well socialized dog should be safe meeting other dogs, but he should also be able to enjoy walks in the park with his family without being able to run up to every dog or share space at an outdoor cafe with other dogs near-by. Use professional facilities in the early socializing stages to insure the other dogs are vaccinated and safe to play with your dog. If you are going to use a dog park, make sure you like your dog’s behavior and the type of play he’s exhibiting that day. You can always leave if it is getting too wild. Frequently reward your dog for checking in with you and paying attention to you when other dogs are around. If you want a dog you can take everywhere, the most important friend in their life should be you. As your dog’s life stage changes, his socializing needs will change as well. The older dogs tend to enjoy playing with dogs they already know and have established communication with. For every hour of group dog play, you do you should spend 2-3 times that playing with your dog and building focus and communication with him. Play between you and your dog will create a wonderful bond that will establish your relationship and enrich both of your lives.